Without a doubt, braided line is one of the most useful tools that a bass angler has in his or her fishing arsenal each year. From pitching and flipping plastic baits into the mats of heavy vegetation and cover that might hide a lunker bass or two to casting a frog into a vast field of lily pads, no bass aficionado should be without a rod and reel rigged up with braided line this spring and summer. While braid doesn't readily lose its strength over the course of a season, heavy use and exposure to the sun can cause the coloration of the line, especially the first 40 to 60 feet, to fade a bit, however. Given the high cost of top-end braid, don't cut off the bleached portion of the line every few fishing trips. Instead, borrow a trick that Major League Fishing pro Kevin VanDam uses when fishing with braided line. 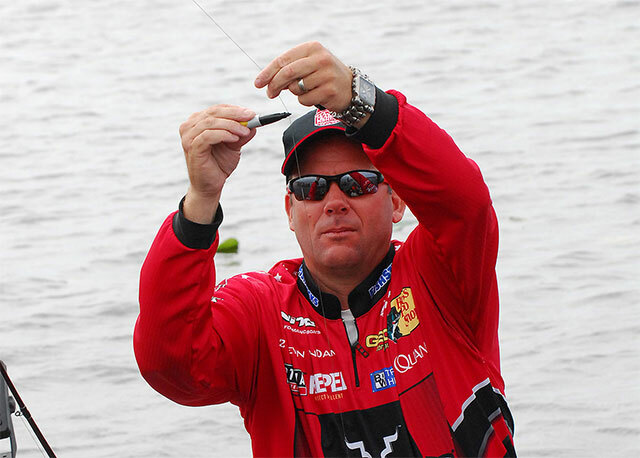 Having covered each one of VanDam's MLF events since it all began a few years ago on Lake Amistad in Texas, I have seen KVD use this trick numerous times as he works on his tackle during the breaks that occur between periods during an MLF competition day. What does KVD do? Simple, he takes a dark colored Sharpie that matches the hue of his braided line and uses it to add color back to the line. By doing so, the four-time Bassmaster Classic winner and seven-time B.A.S.S. Angler of the Year is able to keep his line less visible in the thick and dark places where braid gets utilized. Keep in mind that VanDam isn't the only professional bass angler to use this trick. In fact, many other MLF, B.A.S.S. and FLW Tour pros do the same thing to their braided line, often cutting a small notch in the Sharpie's tip to help guide the marker up and down the length of braided line that they are trying to recolor. So the next time you're out on the water and using a rod and reel loaded up with your favorite braided line to try and catch a bucketmouth bass, keep a Sharpie handy on the front deck of your boat because it could mean the difference in getting a hefty bass to bite or in going home empty handed.